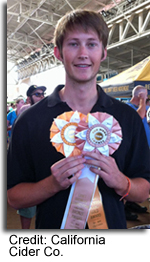 The San Diego County Fair ran from June 8th – July 4th and encompassed the 7th Annual San Diego Beer and Cider Competition as part of the San Diego International Beer Festival on June 21st – June 22nd. Every year more and more ciders are introduced alongside beers in the competition for judging. This year, more than 8,500 beer cicerones, beer-vangelists and just plain beer lovers attended the festival along with more than 400 beer selections from around the world. Of the breweries in the competition, they hailed from 16 different countries and 22 different states. The Lost Abbey Brewery from San Marcos, CA once again received high marks and the Champion Brewery award. However, the Best of Show award went to Eagle Rock Brewery’s Equinox, a blonde ale from Los Angeles, CA. 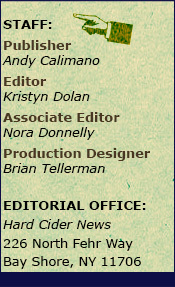 Ace Ciders will be competing in the International Beer Competition held in Rhode Island on November 9, 2013, a competition that the California Cider Company has won an award in during the spring version back on April 20th. To learn about the San Diego County Fair and to see the complete results of the San Diego Beer & Cider Competition, please visit SDFair.com. The San Diego County Far is the largest annual event in San Diego County, the largest county fair in California and the 4th largest fair in North America drawing over 1.5 million visitors each year. The last decade saw an explosion in the craft beer market in the United States, with sales increasing 15% in volume in 2012 alone, according to the Brewers Association. However, beer sales increased by less than 1% in volume overall. In comparison, Information Resources Inc. reported hard cider sales account for less than 1% of U.S. beer sales, but grew nearly 85% at chain and convenience stores last year versus 2011. This leads us to believe there is certainly room for cider to grow; and as the cider market in America grows, so will cider selections in your favorite bars. Bars and restaurants find themselves adding a variety of different ciders to keep up with America’s changing tastes. The Queen’s Kickshaw, a bar located in Astoria, NY, has 30 varieties of bottled cider, as well as one cider on draft that is rotated frequently. When the Kickshaw opened a year and a half ago, they started with just three to four ciders. They noticed an increase in cider popularity, and received requests for different varieties. It wasn't long before they increased to 10 ciders and now up to the 30 ciders they have today. 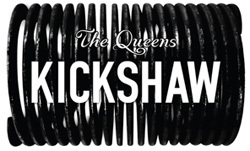 In regards to increasing the variety of ciders they sell, the Queen’s Kickshaw faces similar problems that every bar owner in New York faces—they lack the space to increase their stock, but expect to utilize a rotating stock soon enough so that they can get more of their customer’s favorite craft ciders in. 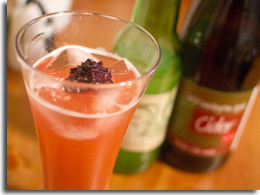 Another bar in New York that has a plentiful cider supply is Hearth located in New York City. Starting with four to five ciders, David Flaherty, Operations Manager of Hearth, says that word spread quickly of their cider supply and the bar now carries nearly 15 different varieties of cider. However, it wasn’t just in the bar that cider was being accepted by more and more people. Flaherty believes that cider’s popularity is on the rise because “people are on the hunt for new beverages — new flavors” and cider provide s them with just that. Flaherty described that sales tend to increase dramatically during and after New York’s Cider Week, which will take place October 18th – 27th throughout New York City and Hudson Valley this year. Bars in New York are not the only ones carrying more and more varieties of cider—the trend is popular among the entire country. In Seattle (WA), The Noble Fir carries a massive stock of ciders. With two to three taps and nearly a dozen different brands in bottles all on a rotating cycle. 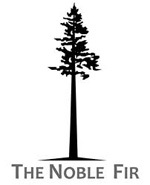 Throughout the year, The Noble Fir finds itself serving over 50 different types of cider, focusing on craft ciders from local cider producers. Ellen Kelly, Co-Owner of The Noble Fir told us, “Originally when we opened up [three years ago], it was difficult to find cider on tap so we worked with local cideries to get their ciders into kegs.” We can thank Kelly and the Noble Fir for their help to spur the growth of cider in Seattle and encouraging the distribution of cider from the producer to the customer. Kelly believes that cider is rising in popularity at her bar because beer drinkers who normally wouldn’t try cider are trying it since they see it on tap. Further, cider is the beverage of choice for her customers that adhere to a gluten free diet. In San Francisco (CA), Turkish natives Ozzie Gundogdu and Omer Cengiz, who moved to the city in 2004, opened Upcider when they were unable to find a cider destination in the Bay Area. They describe the cider bar as a cider house-gastropub with an extensive cider list that includes over 80 different ciders all in bottle (no drafts). Although their ciders are globally sourced, their cider menu has a particular emphasis on ciders made in the US and UK. Bars all across the country are beginning to accommodate cider drinkers as cider’s popularity grows at an incredible rate. Establishments like The Queens Kickshaw, Hearth, The Noble Fir, and Upcider, are paving the road for cider in your bar scene. Be on the lookout for cider to make its way next to your favorite beer in your local bars. 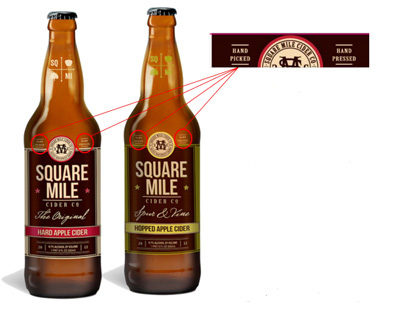 Earlier this month, Square Mile Cider Company (SMCC) announced the voluntary recall of 2,500 cases of Square Mile Original Hard Apple Cider and Square Mile Spur & Vine Hopped Apple Cider. SMCC has recalled these products due to concerns that cider from the company’s first production run may be refermenting in the bottle, which may cause the bottles to burst under certain circumstances and can lead to potential flavor inconsistencies. Consumers who may have purchased the affected product should dispose of it immediately in an outdoor trash receptacle. “As a handcrafted, small batch cider maker, we take all packaging and product quality concerns very seriously. We are working with our wholesalers and retail partners to remove all affected product from store shelves as quickly as possible. We are also confident that we have identified the problem and want to reassure our consumers that we stand by the quality of our products,” said Lorin Gelfand, Brand Manager for SMCC. To date, no consumer illnesses or injuries have been reported. 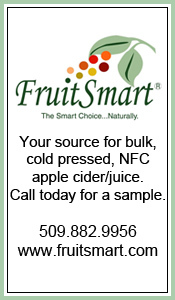 Consumers with questions about the quality of their SMCC products may call the company toll-free at 1-855-371-0895 (8am-4pm PST), visit SquareMileCider.com/contact, or write to 929 N. Russell Street, Portland, OR 97215. Do you have extra apples that are going bad? Make them into cider with little complication or cost! All it takes is the “juice and strain” method developed b y Dr. Neville Stewart of the United Kingdom. Stewart, an accomplished organophosphorus chemist has developed this easy cider making method that can be brought into any home kitchen that any person can do. Stewart started producing cider in 2011 when his neighbor, Nick McDuff, had an excess apple crop of about 700 pounds. In previous years, McDuff had disposed of his apples by throwing them into a compost heap. However, during a lunch with members of the Scillonian Road Retired Gentlemen’s Walking Club, the club discussed what to do with McDuff’s apple surplus when Stewart suggested that they attempt to make cider. The process started off with great difficulty as none of the members of the newly found Scillonian Road Cider Co-operative would donate money to acquire a proper pulper and press. Fortunately, Stewart’s daughter was generous enough to provide a small kitchen juicer. This machine took them over three hours to produce three demijohns worth of juice. Once they realized this approach was impractical, they picked up a whole fruit juicer at a charity shop for twenty-three dollars. Another challenge that plagued the group came from Stewart’s wife—an incredible mess was being made in their kitchen. This was remedied months later by changing the process from straining the juice into an empty pint glass and manually emptying it, to using a hose, straining bag, and a bucket with multiple small drill holes at the bottom. 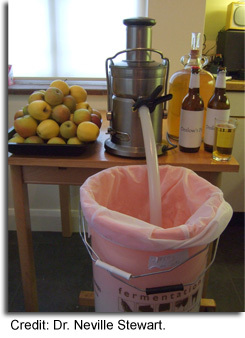 To begin cidermaking using the “juice and strain” method, purchase the following items: a whole fruit juicer, tubing, two buckets, straining bags, a fermenting bin and the usual wine making items (i.e. fermenter). 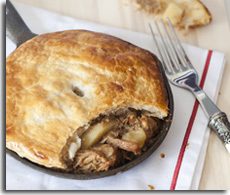 The ingredients required are even easier, consisting of merely apples, yeast and a small amount of sugar. A more detailed video explanation of the process is available on Stewart’s Onslow Dry YouTube Channel. Stewart’s production method appeals to those looking for the freshest cider and all natural ingredients. Their cider is produced solely from whole apples with no additives other than a starter yeast and a little bit of sugar for priming. Stewart explained that much of the cider available in the UK is called “white cider” described as “hard cider produced on an industrial scale from apple concentrate, imported mainly from China, and glucose syrup.” Furthermore, Stewart explained that the biggest benefit of his cidermaking method is that it is “quick, clean and efficient” which makes making cider possible for the average person to create. Stewart hopes to see the juice and strain method adopted globally as a method for making hard cider at home. He has provided tools like video instruction and a blog for people to utilize. If you’re an avid cider fan and want to start producing at home, give this cidermaking method a try! For those of you that love your Lemon Shandy here’s another refreshing alternative for mixing beer… Snake Bite. 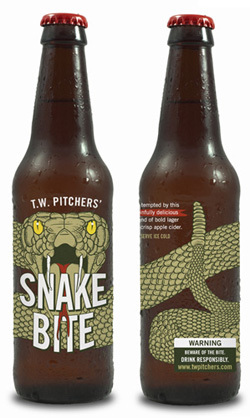 Earlier this month, WG Barr Beverage Company, a San Francisco (CA) Bay Area start-up, announced the release of TW Pitchers’ Snake Bite, a bottled blend of beer and apple cider based on a popular British pub-mixed drink. Snake Bite is the result of two friends with a common interest in the craft beer industry planning to start their own beverage company. Wilson Barr and Tommy Hester, founders of WG Barr Beverage Company, met at Williams College in 2007, where they were teammates on the baseball team. However, it wasn’t until Barr studied abroad and visited Great Britain that the friends began hatching their plans for Snak e Bite. When Barr returned to the US, he and Hester realized that there was a great opportunity, due to the rapidly growing cider industry and the fact that it hasn’t been done before, to be the first to bottle and sell Snake Bite in the United States. Now two years later, after crafting a business plan and spending many late nights taste testing, the founders launched the beverage. Snake Bite is a new version of the British pub favorite bottled for the first time. The result is a refreshing, crisp, and cold beverage for beer drinkers and cider drinkers to enjoy equally. Snake Bite contains 5.1% ABV. For more information, you can visit TWPitchers.com or email info@TWPitchers.com. 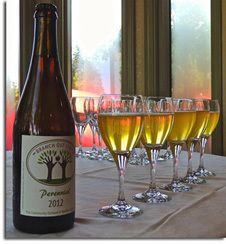 Branch Out Cider welcom ed the release of their first cider, Perennial 2012, with an Orchard Party to celebrate the new product and the apple tree owners that contributed their apples to the making of the product. Five years ago, Matt Fater and Aaron Fodge started making cider by hand-pressing apples. As they began sourcing apples though, they could help notice the amount of apple trees in and nearby the Fort Collins (CO) area – where they are located. 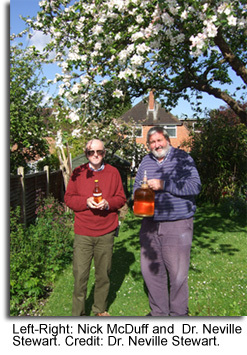 As a result, they came up with the idea of a “community orchard.” The concept is easy – people with apple trees that have a surplus of apples or find their apples are beginning to turn can register their trees with Branch Out Cider and someone from the cider company (perhaps Fater or Fodge themselves since it’s a small operation) will come and harvest the apples. After, the apples are pressed and the juice is fermented. Excess pulp is fed to chickens. Fater told InnovatioNews, “From August through October , we collected fruit from 40 different properties.” Fater and Fodge estimate that there may be more than 600 trees in the Fort Collins vicinity though so the company is hoping even more owners will register their trees with Branch Out Cider. The “community orchard” apples used for Perennial 2012 produced a dry, sparkling cider blended from Empire, Portland, Winesaps, McIntosh, Red Delicious and a number of heirloom apple varieties. With an 8.5% alcohol content, the cider can be found in 750ml bottles in select locations in the Fort Collins (CO) area. There were a little over 170 cases produced (2,000 bottles) though so get it as soon as you can! For more information or to register your tree to participate in the 2013 apple harvest, please visit BranchOutCider.com or contact Aaron Fodge at Aaron@BranchOutCider.com.